Having been homebound for most of the past two months, thanks to my chronic illness flaring up, I haven't been able to go out with my friends or even make it to my book group meetings, so last week, my two closest friends brought Girls Night Out to me! They came over with take-out Thai food, and we watched a movie in our family room - complete with recliners for everyone. 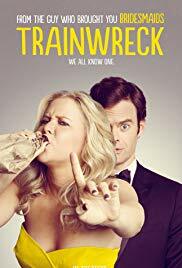 We were looking for a light, funny movie and ended up watching Trainwreck, which was definitely light and funny, though perhaps a bit raunchy for some tastes! Amy Schumer stars as Amy, a writer working for a men's fluff magazine called S'nuff in New York City (with hilarious article titles). Besides being focused on her career, Amy was brought up to believe that monogamy is not possible, a view instilled in her by her carousing father, Gordon, played by Colin Quinn, to explain why he and her mother broke up. Now, her father is aging, but Amy has stuck with his dysfunctional life philosophy. As a result, she drinks a lot, smokes some weed, and sleeps with lots of guys. Officially, she has a boyfriend, Steve, a muscle-bound hunk played by John Cena, but Amy still has one-night stands with other guys. Her rule is to never spend the night. Then, her editor assigns Amy to write an article about the "sports doctor to the stars," Dr. Aaron Connors. Amy knows less than nothing about sports, but she wants a promotion, so she spends time with Aaron, interviewing him for the article and getting to know him. She's attracted to him - and vice-versa - but he doesn't fit her usual type. He's intelligent, sweet, and kind. Will Amy be able to break a lifetime of conditioning to commit to one man? Oddly, I think this is the first time I've actually watched Amy Schumer in a movie, even though I know of her, have heard interviews with her, etc. Directed by Judd Apatow, Trainwreck features his signature fast-paced amusing banter throughout (think Knocked Up, 40-Year Old Virgin, Bridesmaids, etc.) and also that same kind of raunchy, silly humor. I think it might have been a bit too raunchy for my friends (especially the one-night stand montage! ), though we all laughed. As for me, I tend to prefer a more clever, dry wit in my comedies than such obvious silliness, but I enjoyed it overall. The cast was good, the banter funny, and like all romcoms, it has a happy ending. The side plots about Amy's relationship with her sister and how they are adjusting to their father's aging were even tender and moving (and still funny). It's a fun, mindless ride for when you are looking for escape (and aren't easily offended!). Sometimes, that's just what you need. Trainwreck is available for streaming on Amazon, starting at $2.99, or on DVD. I've never been a fan of Amy Schumer (or Tina Fey) so this is a pass for me. I think this is the first time I've watched Amy Schumer in anything. I haven't seen a lot of Tina Fey, but I liked her in Date Night (silly but fun) and Admission. Definitely, this one isn't for everyone!